This is why I write limericks using three word prompts, why I write flash fiction and why I like hashtag games. It's also why I find open-ended, formless projects difficult. I need something to push against in order to produce interesting, amusing or otherwise valuable work. 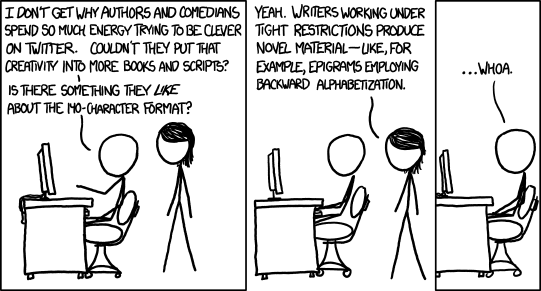 I'm clearly not alone in this, or XKCD wouldn't have the same observation. But what about you? Do arbitrary limits inspire you as things to be overcome? Or do they cage you in? I completely agree. Time limits are a big motivator for me, even if its self-imposed. Nanowrimo's deadline makes me produce a fast draft, Friday Flash makes me sit down and write, edit, and (hopefully) get my shorter fiction read before posting. The word limit for flash helps me trim the fat. And it works for other things as well. I noticed that when I went vegetarian, and later vegan, my cooking became much more creative. I tried new things, branched out. My diet is much more varied than it was before. I'm not sure. Targets and limits do help but I think I'm happiest when I can just do what the hell I want. I just seem to have a minimalist streak -- but that may just be how my "constraints" thing manifests itself? I prefer haiku to sonnets, flash fic to novels, etc. I think constraints can be both helpful and also limiting. In essence you're taking your world and building a brick wall around it. This is good if it helps you focus on what's in front of you instead of constantly watching and yearning for the horizen, but it can also be limiting. If, within our metaphorical walls you've started a garden of writing that comes to bloom it can be beautiful and awesome. If your tale grows from flowers to one of trees yearning to break out out beyond their confines, and you rigidly bound them within the walls, then you are losing some of the beauty. At least that's my take. Use the walls, but don't forget that you still ultimately control them, too, and not the other way around. Constraints help in some ways. I mean the word limit of flashes do help with writing tighter, I think. It helps you see what you can do without. Well, it helps me see that, which is why I write flash. But at the same time, they can be limiting if you don't know when to break the constraints. Constraints are great if you have the freedom to choose that constraint. It's when someone else forces them on you - so that you have to write something you don't want to - that they're limiting. This is why I like Haiku. Even though not everyone agrees with the 5/7/5 form in English (and, in truth, such does allow for more than the Japanese equivalent), the constraint requires that I work a little harder to get something that fits the form and conveys the thought and/or feeling I'm aiming for. There's art and there's craft. Focus only on the form and all you have employed is craft - and I've exemplars of that in my haiku. Focus only on the art and I may end up with something beautiful, but (for me) isn't Haiku. And, sometimes, I manage to hit the balance between the two. That's when I feel I've created something worthwhile. The same is true for themes, prompts, lengths - whether self- or other-imposed. Art and craft, craft and creativity come together. And, for me, the result can be better than it might have been otherwise. I think constraints are key to anything that can be legitimately called art. In visual art, the constraints are so obvious that one might not even recognize them as constraints. Oil on canvas, pencil on paper, or marble sculpture? Realistic, surrealistic, or abstract? Composing music is the same way: Western tonalities, modes, or serialism? Instrumentation? Rondo form, sonata form, blues form, or freely composed? Writing is the same, too. you limit yourself whether you know it or not. It's why there were no aliens in the Harry Potter books, why there were no talking animals in Lord of the Flies, and why Ulysses is hard to read. I like constraints. Without pressure I'd never get anything done. Haiku and limericks employ familiar, short rhythms. That works for me, and helps put humor and succinctness into it. Boundaries are fine; otherwise I'm too verbose; editing's good, too.